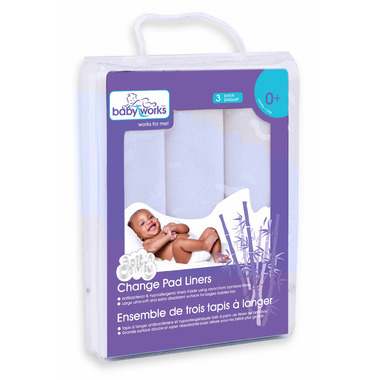 The Baby Works™ Bamboo Change Pad Liners are soft and comfy on baby's delicate skin, while the 3 layer design is ultra-soft and extra absorbent to contain messes. The rayon from bamboo terry cloth fibres are naturally antibacterial and hypoallergenic, plus they are machine washable and dryer-safe. 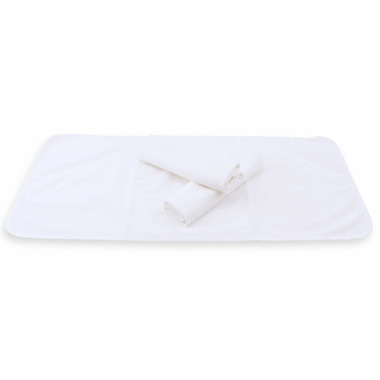 Large ultra soft and extra absorbent surface for larger babies too! These are very small. I did not expect these to be so small, they cover about 1/3 or the change table. Wish they would cover the entire size otherwise I have to make sure I put the baby on the right spot. Good material and product just extremely small.